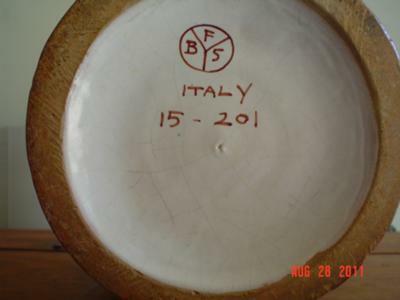 Pottery Mark Query - FBS OR BFS in Circle, Italy, 15-201:- Hi there, hope you can help me out. This vase has been in my family as long as I can remember, I'm 36 now. No one is left to tell me where it is from. All I remember my mother telling me about it, was that the red color was dove's blood. Not sure if this is true or not. I've done the typical Google search for every combination BFS/Italy/vase/pottery, etc...discovered that BFS might actually be FBS. I found an Ebay link to a piece of Czech pottery that showed the same symbol, but that was all. I did try your search box up top, one link lead me to a web page of a string of gibberish and the other lead me back here. That was from searching under FBS Italy. I am curious to know this vase's origins and make so that I make determine it's value. Let me thank you in advance for any assistance you may provide me. I have attached two photo's per your request. You did well on your searching. We have another thread covering the French version of this mark - which is in a triangle rather than a circle. You found out that it as also Czech. I looked on a specialist Czech pottery marks site and saw that it was listed on the unknown marks page (http://www.collectorscircle.com/bohemian/Porcelain-2/porcelain/unidentified/marks1.html) and the publisher was asking for information on this company. I was wondering whether this mark was that of a US distributor or retailer, rather than a maker, because that would explain them sourcing wares from various countries. Anyhow, this vase looks interesting - the pattern highlighted in dove's blood (nice story - never heard that one before!! - I'll ask a ceramicist expert if it is possible - you never know!) is produced by a technique called scraffito and looks quite nice design quality to my eyes. Interesting post, thanks. Let's hope we can find some answers for you. Ferdinand Bing & Co Successors of New York, USA; suppliers of pottery, glassware, art wares, bronze statues, marble sculptures, novelties and lamps. OK, great - an interesting lead which I thought I must follow up and do some more research to verify or not as the case may be. where Christopher, the webmaster of PM&M (a very thorough researcher) who concludes that the FBS mark is a hitherto unidentified importer - most likely to the US. As Chris notes on his well put together page, the country of origin of FBS pottery marks is as diverse as Italy, Germany, England, France and Czechoslovakia. So as I said above, likely an importer of goods to the US who had the buying power to have their own mark developed. So then I did some more digging, under the assumption that an importer normally imports more than just pottery - so what about glass products and jewellery items, for example? 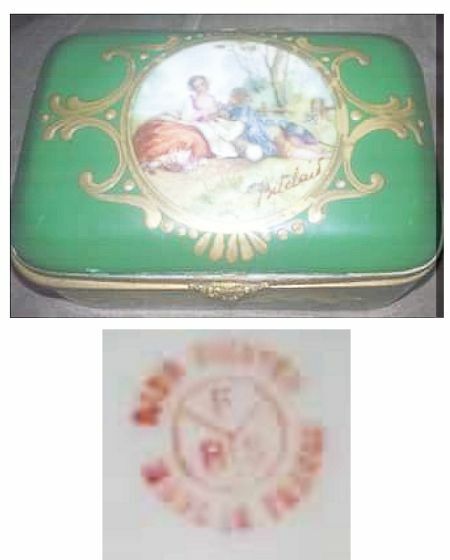 and under the "Vintage Jeweled Filigree Vanity Accessories From the 1890s-1930s" manufacturers section, listed the FBS mark as belonging to "Ferdinand Bing & Co, Successors" and identified them as "Importers of porcelain, bronze, glass, etc from around the world". So, we can safely say that in the Victorian period there was a US importer of art works, pottery and other types of wares called Ferdinand Bing & Co Successors (not sure what the 'successors' word means). We can also say that the FBS mark very likely belonged to a US importer of the same period. However, I have yet to find conclusive proof that the FBS mark we are seeing here is attributed to Ferdinand Bing. 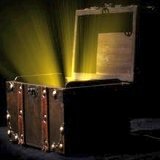 I am sure we will find it (please post here or email me if you have pictures). In the meantime, we can only say that FBS is likely to be the mark of Ferdinand Bing, importers of artifacts to the US. P.S. 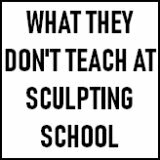 It was interesting to note that renowned and accomplished marble sculptors of the day were very scornful of the marble sculptures imported by Ferdinand Bing, accusing them of copying, stealing ideas and importing cheap mass-produced rubbish. Looks like Ferdinand Bing were in some sense piling it high and selling it cheap (or perhaps, more accurately and less disparagingly, making artworks and ceramics more accessible and affordable to the general public). I, too, have a strange little hand painted trinket box with a signed scenery on the top! The bottom has the mark " F.B.S " In a sort of peace sign design, inside of a circle, with the words " hand painted - made in France". I've done research on the artist signature (Belclair? ), and found nothing!! Only when trying to find the initial FBS on the bottom did I find you post !! Please try to send me more info!! I have no idea where else to looks! Thank you very much in advance! And maybe this may help in your research through the artist!!??? I have a white and turquoise porcelain vase that has the markings FBS in a circle as well. My email is [email protected] if you send me an email i can send some pics back and hopefully they might help and if not please keep me in the loop with what you find out, as i will if i find out anything. I just emailed you, so just send the photos in and I will upload them for you. I too have a vase with FBS in a circle with Italy underneath the circle and 9/101. it is white with turquoise leaves much like a grape vine and turquoise edge at top. 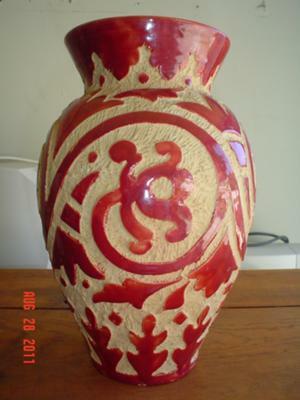 Hi - I am thrilled to have found this discussion on FBS pottery marks! I have a 9" tall very colorful vase/ginger jar (13" with the lid on). on the bottom, it is marked with an upside down peace symbol with the letters FBS inside. It is also marked "Belgium" (right under the circle), "Hand Painted", and "D.69." Also, carved into the bottom is: "1RKT" I can't tell you how much internet time I have spent searching for information on the origins and worth of this vase. I purchased it for about $5.00 at a garage sale, and I'm hoping it may be worth something. 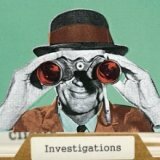 Can you help if I email pictures to you? Any further info about the vase would be much appreciated! Thank you. My vase is turquoise and green and yellowish-green with white flowers. Has the circle with FBS and the numbers 182-104. With Italy underneath..wondering if this is worth anything. Would appreciate your help. Thank you. I have a vase that is green - tourqois in color with rough brown ceramic background. a bird/chicken image with plant or flower on stem adorns the vase. My sister in law was suppose to have given Tommy mother in law. Any new info is appreciated on these pieces. Don't know how old this site is but hopefully still active! I have 2 porcelain perfume bottles with daubers. FBS in circle separated in triangle Germany marked below circle. Would love to send pictures from email [email protected] and have you comment!